Mueller designed as “blockade” for Dems. This is why they defend him. Barr confirmed next wk > Mueller SC end > RR out, DECLAS, IG rpt. Whitaker ID’ed leaker(s)? Scaramucci > Priebus & Spicer out. Schiff & SDNY-AG (former AG Bharara?) will try to stall final Mueller rpt. Couple older drops re: Mueller ‘BLOCKADE’. Reminder about The ‘Scaramucci’ Play. He was a temp hire to out ‘untrustworthy’ staffers. Not sure yet who Whitaker’s DOJ/FBI targets were/are. Work re: #ThePlan continues behind the scenes. #Mueller “designed to” drop 2397 list some reasons, all of which add to an #Obstructionist agenda. This is why they defend him. With #Barr set to enter on 14th Feb an end to the #MuellerProbe is close. When done there will be no need for #RR & there’s hoping #Whitaker takes his place. He served well, having gotten the #Ds so worked up they felt they had to question him, & for what. #Scaramucci removed #Spicer & #Preibus. When the #RussiaProbe ends, the #Ds will begin their investigations on #POTUS. The #DECLAS would act as a stopgate. #Projection, will continue as a tact, by both the #HouseDems & #HouseCommittees. The #OIG will continue to release updated reports. The exposure of truth will become indisputable & undeniable. #Whitaker has investigated leaker(s). #Schiff & #AGLetitiaTishJames, a life long #DemActivist, will work to continue a blockade opposing #POTUS’ efforts. #Huber’s team doesn’t suffer from leaks. QAnon breaks the silence. Optics are important because Q preparing to take the message Public. Q says he has been operating in stealth mode. We’ve seen a lot of action the past couple of weeks while q has been silent (think “practice raids” by army, unexplained explosions). Mueller was to stall all investigations into deep state actors by House and Senate until Demonazis took back congress. They failed to take senate otherwise what is happening in house would be happening in senate (shut down of all investigations into FISA abuse). @potus pulled carpet out from under Dems by using threat of FISA declass and other docs to hold Mueller at bay and force him to work for @potus. I do not believe there was just one stealth bomber at work but several. Mueller is a stealth bomber working for @potus. AG Whitaker was a stealth bomber working behind the scenes as well. AG Whitaker is the hatchet man…he is being used in same way @potus used Scarramucci. Comes in, cleans house, leaves. Does the dirty work and outs any addtnl leakers and brings Mueller investigation to a close. Does not matter if AG Whitaker viewed by public as being partisan. His job is to make sure Mueller wraps things up and then close it down. Whitaker was not recused from oversight of Mueller so he has authority to fire him if need be. No need since mueller fighting to stay out of prison. The Mooch removed Reince Priebus and Sean Spicer. Once Mueller is out of way, declass of FISA warrants (Carter Page, George Papadop, @GenFlynn ) will occur. FISA brings down House. Rosenstein will be terminated or step down. OIG report will finally be declassified. @RepAdamSchiff annoucned this past week more investigations would be underway related to everything Trump. Dems in House will of course say @potus declass of FISA is political attack because of investigations launched against @realDonaldTrump by House. They will try to change narrative to take public’s attention off their own corruption and crimes. Exhibit Alook at a clip of the FakeNews reporting on the upcoming investigations. Attempt to prepare the narrative. Adam Schiff investigations and Assis Atty Gen of Southern Dist of NY is all that is left in the cabal’s arsenal. Again, look at the FakeNews clips from past couple of days. Predictable. But , #qanon knew. Q tells us to compare Mueller investigation, Schiff’s investigations, and SDNY investigation to that of Huber. No leaks from Huber. There is action though. 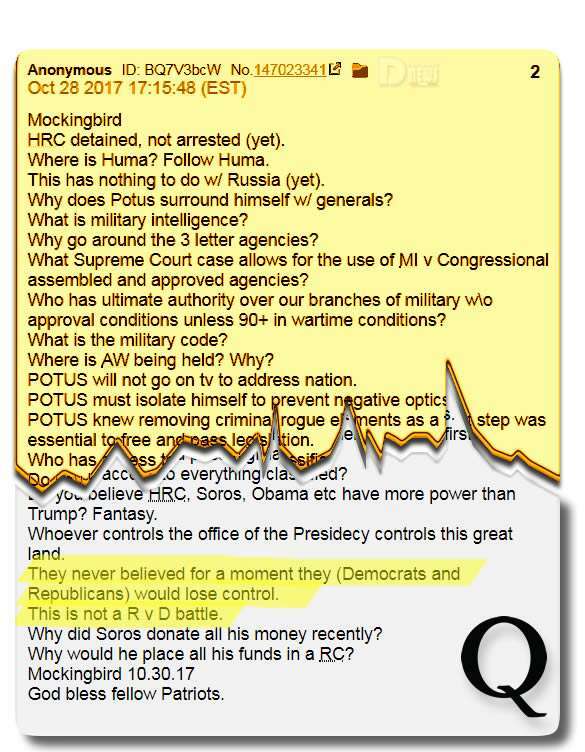 A nice preview from Q of what’s coming down the line for the Swamp and why things had to roll the way they did. This is not just another 4 year election. Uh uh. It’s time to return publicly. Great timing too…so many people get worked up when Q isn’t posting. Not sure who they are referring to when they say “It’s time to return publicly.” I know who I’d LOVE to see return to Twitter publicly, though. This entry was posted in Uncategorized and tagged Disclosure News Italia, Fe. 10, love, QAnon. Bookmark the permalink.